Peter and his grandpa's miniature railway across the farm has been a lot of fun since they built it. Adventures, visits, races and near disasters have all been a part of the story so far. But now the farm is in the grip of the coldest winter for years. The tractor has frozen and the only way to feed the animals is by train. Their great project when summer arrives, is the construction of a watermill on the river to generate electricity. Apart from the appeal of making something useful out of scrap, it gives Peter the opportunity to learn all about electricity, energy and power. A long rainstorm means there is plenty of water for free electricity, but the river bursts its banks. 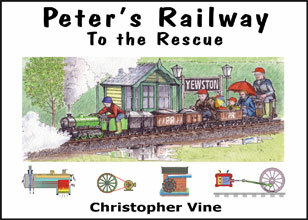 Can a small steam locomotive make it through the flood to rescue the village? The technical aspects explained include: The snow plough, electricity, watermill, electric motors and generators, and driving a locomotive.